Q: UN Under-Secretary-General Jeffrey Feltman starts his 4-day visit to the DPRK today where he is set to meet DPRK Foreign Minister Ri Yong Ho, among other officials. He will also visit China. Considering the current sensitive situation on the Korean Peninsula, what is China's expectation for Under-Secretary-General Feltman's visit to the DPRK? A: China is pleased to see the UN playing a constructive role in helping properly resolve the Korean Peninsula nuclear issue. During UN Under-Secretary-General for Political Affairs Jeffrey Feltman's stay in China, Vice Foreign Minister Li Baodong met with him where the two sides exchanged views on the UN affairs and other issues of common interest. Q: Nicolas Maduro, the president of Venezuela, yesterday announced the creation of a new cryptocurrency. As China is its main creditor, I would like to know your views on this and if China would accept this as a method of payment? A: We have noted the report and still need to check on the relevant details. China's financial institutions continue cooperating with the Venezuelan side in accordance with commercial practices and on the basis of reciprocity and mutual benefit. Q: The China-Japan High-level Consultation on Maritime Affairs, which has been running for many years, is now underway in Shanghai. 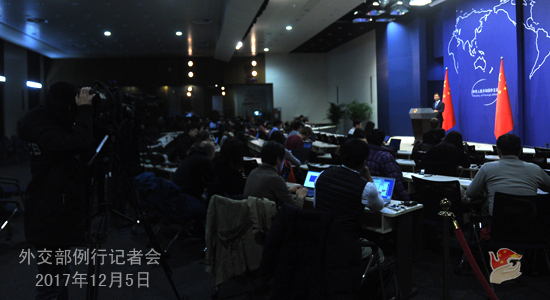 What is China's expectation for the latest round of the Consultation? A: As agreed by the two sides, the 8th round of the China-Japan High-level Consultation on Maritime Affairs is held in Shanghai, China on December 5-6. The mechanism of the China-Japan High-level Consultation on Maritime Affairs is a comprehensive one for communication and coordination on maritime-related affairs. China looks forward to exchanging views on maritime-related issues with the Japanese side so as to strengthen understanding and mutual trust. Q: According to reports, Australian Prime Minister Malcolm Turnbull on Tuesday commented about Australia's new laws that would bring in a ban on foreign political donations to try to avoid external interference and he said that this was in part driven by the disturbing report about Chinese influence. Does China have any additional comment after Mr. Turnbull's remarks? A: I haven't seen these remarks by Prime Minister Malcolm Turnbull. But I already explained our principled position yesterday. China always follows the principle of mutual respect and non-interference in each other's internal affairs when it comes to developing friendly cooperation with other countries, and this principle holds true for developing bilateral ties with Australia. We have no intention to interfere in Australia's internal affairs or exert influence through political donations. 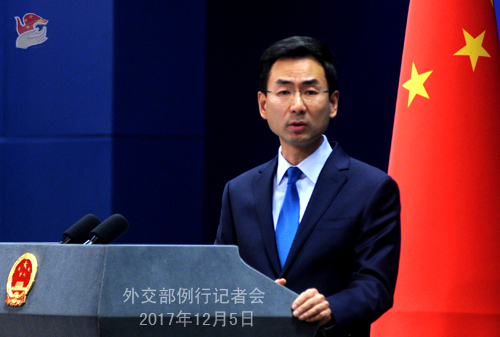 We would like to once again urge the Australian side to discard bias and look at China and China-Australia relations in an objective and fair manner. The sound and steady development of the China-Australia relationship serves not only the interests of China but also those of Australia. We hope the Australian side could have a clear understanding of that.